Scorched Baeksuk of Seongbuk-dong (성북동 누룽지백슥) is a place that I’ve been meaning to go for some time. It’s at the very top of Seongbuk-ro, just where the road bifurcates (left, over the mountain to one side of Samcheong, or right up to Daesagwan-ro & the tunnel to the other side of Samcheong). Aside from large posters advertising jazz lately, What caught my eye was that it’s such a modern building. So was the Barley Tablet, come to think of it (and, come to think of it, I really need someone to check these weird Google Translate results). The interior was very nice, with (quite unusually) art on the walls! A very pleasant place, and bright with those big windows. BTW, Baeksuk is “a Korean culinary term referring to dishes made by boiling or steaming meat or fish to be cooked thoroughly without seasonings” according to Wikipedia. You sign in on a white-board, with your name, number of people and what you’re ordering from the short menu. I was a little unclear on this, but a nice Korean lady explained (she later came to my table and said if I had any questions, just to come over & ask her; very nice!). 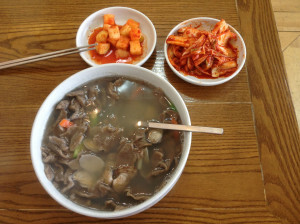 I ordered the Buckwheat Sujebi with short-necked clams (바지락 메밀수제비, Bajirak Memil Sujebi). Sujebi is hand-torn flat noodles. Not very good on the side dishes — sjust kimchee and radish kimchee. But really good! and boy was it spicy! So not much to say there. But the soup itself wsa excellent, good noodles & plenty of clams. So we’ll give them a pass on the side dishes — it’s not their thing here. But I really need to come back with more people (say, with Aingeal and That Girl) to have the house specialty. 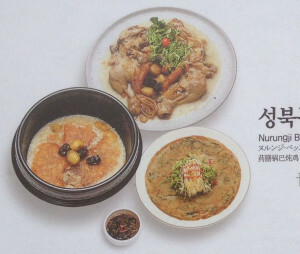 Everyone on the white board was ordering it, and the Korean lady said it is the house specialty, Nurungji Baeksuk 성북동 누룽지백숙 / 메밀전 (Boiled checked with burnt rice soup).